For most of the time since independence from the UK in 1956 Sudan has been in civil war. The people of the South, mainly black tribes, have sought independence from the northern Arab-led Government based in Khartoum. A result was the breakdown of the infrastructure of the South, including its education system. Joseph and Karin saw the need for education for the children in Joseph's home area of Aweil, Northern Bahr-el-Ghazal state. Since 2000 they have been providing schools under the trees, with a few resources that could be packed into bags and moved if the fighting came close. Thousands of children got some schooling as a result. A peace agreement between North and South was signed in 2005. They were able to pursue their vision of a permanent school, to help the girls who are such an important part of the community. 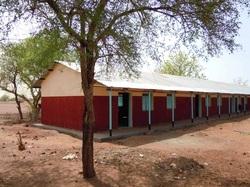 With the help of supporters they created the charity ‘Under Tree Schools’ and raised funds to build the school. The local community of Malek Alel offered a large site for the school, and they are giving the building work their practical and enthusiastic support. Elias Bak, our headteacher was appointed; and after a grand opening ceremony in April 2009 he is guiding the school through its first years. Children are receiving free midday meals from the World Food Programme. The school has been supported from the outset by friends in Switzerland, in particular Thomas Church in Basel. The Swiss Association of Under Tree Schools, Schulen unter Bäumen has been set up to support the school.